What's cooking in the Compost Bins? The Community Gardens of Santa Clarita is an excellent educational resource for composting. We have a large composting area in the back of the gardens and a committee dedicated to turning out the best product possible to help restore nutrients into our garden plots. 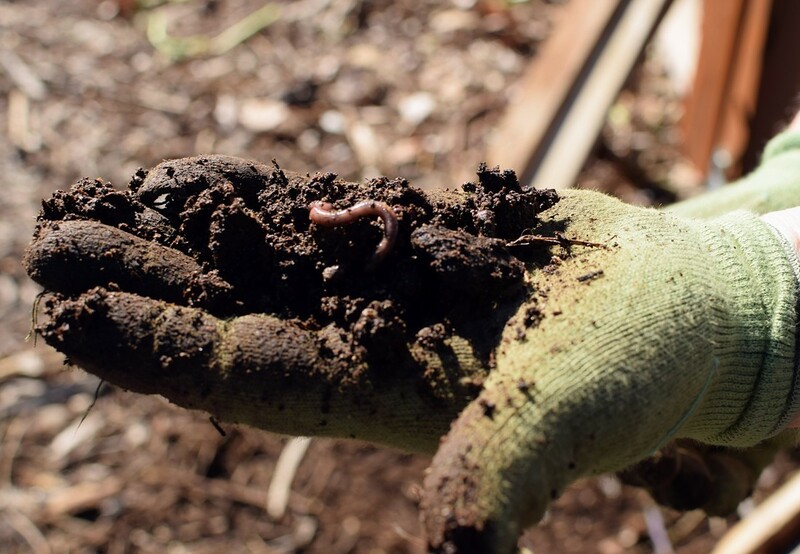 Composting at the gardens helps garden members enrich the soil in their plots, retain water, and suppress plant disease and pests. As our garden use an all organic method of gardening, the compost helps to keep chemical fertilizers out of the gardens. Our compost helps to promote the production of beneficial bacteria and fungi that break down the organic matter to create humus. Humus is a rich nutrient filled material. Composting also reduces the methane emissions from landfills as well as lowers our carbon footprint. Bacteria, the powerhouses of the compost pile, breakdown plant matter into carbon dioxide and heat. A compost pile can get up to 100-140˚ Fahrenheit as it brews. Larger organisms such as worms, slugs, and insects will digest the decomposing matter. They poop out finish compost as they make their way through the piles. Their secretions improve the texture of the compost binding small particles into large clumpy bits. Compost piles consist of green and brown materials. The green materials we put into the compost consist of nitrogen rich plant scraps and the brown materials consist of dried leaves, wood chips, coffee grounds, and bits of paper. If there is not enough nitrogen, the microbes will have a hard time raising the temperatures to kill off most pathogens and dangerous bacteria in the final product. Too much nitrogen and the microbes will not be able to handle it and will give off an odorous ammonia gas. ​A lack of oxygen and the bacteria will not get enough air. The compost pile will start to smell and the bacteria will go from doing aerobic (oxygen environment) decomposition to anaerobic (non oxygen environment) decomposition. Anaerobic decomposition will give off methane and other gases and the compost pile will smell of rotten eggs. Ewww! Turning the compost over and adding dry, bulky material can allow for oxygen to enter back into the pile. ​Yeah!